Question: What efforts should a woman make so the Light would correct her? Answer: She should make all other women and men participate in the movement towards the Light. And she has to do that with her desire! Not by yelling or throwing tantrums, or by making any kind of movements, but only by the inner desire. Nothing exists besides desire. It is the only thing that operates. If you are not acting with your desire, from the inside, then by making physical, external actions, you won’t really correct anything. We have just completed a very good convention, and it was good in the true sense of the word. Some conventions just go by very warmly and nicely, leaving behind a warm patch, like a hot trail. But at this convention we created something bigger. It was a gathering of people who felt Light and warmth in their mutual action. Naturally, we will hold many more conventions like this and will work from one to the next, and will see how much we will change. But if we want to really advance forward, then we must constantly search for the following, better state instead of just trying to hold on to this warmth, this level, this sensation or attainment. We cannot look back. That would be like Lot’s wife who turned into a pillar of salt. We cannot take an example from the past. We have to look forward. I hope that you and I will do just that. I am sure that this spiritual Kli or vessel is growing inside each of us. I felt this. But these vessels still have to unite and achieve that necessary connection between one another so they would be on the minimal, 125th level, so they would be as one, meaning unite together to the 125th degree. We are still lacking this, but are close to it and will definitely achieve it. Therefore, even though we are parting, we have to understand that everything existing in our world—in the coordinates of time, space, and action—is all there to bring us to the goal. Therefore, we have to understand that all of these conditions are necessary for us to become closer. And if we add our unification and mutual guarantee to all of these conditions, then these conditions will be sufficient. This is what I wish for you. Question: What is the correct environment for women, and how can we use it when it is difficult to work with joy and enthusiasm? Answer: The correct women’s environment facilitates in a woman an aspiration to calmly, constantly analyze and synthesize the correct desire: What it should be; how we, the male and female parts of our family, unite and give birth to a spiritual degree. We produce it between ourselves by uniting with each other correctly. Our correct contact brings forth the next degree. This is what the women have to think first. Then, the men will perceive everything in the right way and will act. The wisdom of Kabbalah is not disclosed by itself because people reveal it in their development. It states that according to the structure of the universe, we must come to our starting point again. Initially, one desire was created, and this first state is called the world of Infinity. In this state, the desire and the Light that created the desire exist in absolute similarity, fusion, and mutual complementarity. Here, the desire is filled with the Light, but this is only the conceived state of the future creature. It still feels nothing. Thus, at the beginning, it has to become opposite to the Creator, opposite to the Light. To detach itself completely from the source, the creature passes through five special stages of development called worlds. Thus, the descent of that desire takes place, that is its consistent distancing from its original state. The first world is called Adam Kadmon. Adam is the prototype of a future human. Then comes the world of Atzilut, the world of creation, followed by Beria, the world of emanation,Yetzira, the world of formation, and Assiya, the world of action. These are the five worlds, five consecutive descents, coarsening, concealment, and departure of the Light from the desire which it fills. Each next state is like the world of Infinity except that the Light there exists in a more concealed form. Even now, we are in the world of Infinity because there is nothing else. It’s only that this state is hidden from us behind many inner screens. We have to open them, peel them off, and then, gradually, we will begin to feel ourselves in the true form. This is similar to the state of a person who lies unconscious. This is our state number two, here in this world. We are in complete concealment here, as if we have lost consciousness and exist in some internal fluctuations, imagining something. If we exert ourselves in a particular way and regain consciousness,we will rise to our initial state. This is called the third state. This is also the world of Infinity. We reach it by ascending exactly the same steps of the worlds, which we passed in our descent when we were losing a sense of perfection, the complete presence of the Light. In gradually climbing the same steps, we will experience attainment, the transition from our unconscious state to the conscious one. 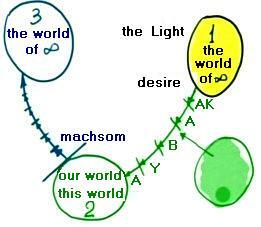 The first exit from the unconscious state into consciousness is called the barrier, Machsom. The most important thing for us is to cross this Machsom, to exit the state of complete detachment from the perception of global nature. Now, we feel nature only in the form of our world and do not perceive it through spiritual desires. We experience the world while being in a totally disconnected state, not using the tools which we have at our full disposal. We feel ourselves through our five sense organs: smell, touch, sight, hearing, taste, and tactile sensation. Thus, our sense of self is passed through our animate body. Then, inside, a specific picture appears in our mind. At the back of our brain, we have a kind of “screen” on which everything we perceive is projected. All that adds up to a single picture of the world. This is not what we see during the exit from the unconscious state. As soon as we have crossed the Machsom, we start feeling completely different states. We begin to sense the Light within. Our desire receives the pleasure of fulfillment, knowledge about the real world, and then a precise picture is drawn inside us. Thus, the plan of the Creator, the original intention of the Light, is to create desire (the Light is primary, desire is secondary) so that this desire, meaning the creature becomes equal to the Light in status, power, and sensations. Naturally, this state is above our world, that is, above time, space, motion, and above the division into life, birth, and death. It is above all of that. By discovering this new feeling inside us, we will sense ourselves existing eternally like all of nature. We will stop identifying ourselves with an “animal” that exists here in this world. It as if disappears from our perception like the smallest of our sensations. Thus regaining consciousness, a person can somehow imagine and recall what happened to him. This sensation remains somewhere, but it is so small, so insignificant, so low in power that it is suppressed by the awareness of the existence in a great new world, infinite, eternal, and perfect. This is the Machsom that we must cross. Is There Any Good In The World? Question: I see not only evil but also good in the world. I have to find the evil inside myself and correct it. And what can I do with the good? Answer: In fact, there is no good in the external world. This is a picture of my egoism. If I aim at the goal correctly, I begin to notice the good root in everything that surrounds me because I start seeing it as the manifestation of the Light, the Creator. And this is revealed only to the extent of my striving to reach the goal through this world. I do not think that you should pay particular attention to this world or analyze it. Begin to aspire to the goal through it, and this world will pull itself up, will change its form. You will discover that there is nothing good if you do not connect your correct intention to it. There is no good in and of itself. There is one huge corrupted desire which turns into good with the intention to bestow, with the intention to work for the benefit of others. All the corporeal entities in our world, that is, everything within that space, be it still, vegetative, animate, a spiritual object or a corporeal object, if we want to distinguish the unique, self aspect of each of them, how they differentiate from one another even in the smallest of particles, it amounts to no more than a “desire to receive” [and hence is felt in this world]. Egoism Is Finally On The Verge! Question: I have a question about becoming disconnected from this life. What happens is that the desire for the Creator leads a person away from corporeality. It seems as if I force myself to love my child, husband, family and go to work because I am supposed to. It feels like a game. For a woman, it is an endless torment, meaning that internally, you are in a state of desire, but live in this world as if playing a game. Answer: It is indeed so. A person cannot tear himself or herself between the two, three, or five desires since desire can be only one. What is the solution then? This occurs if you don’t link and accept all these desires as coming from the same source. You must gather, connect, and make such a “medley” out of them that would erase all the differences entirely. Desire for the child, the husband, the Creator, the group, the parents, and the purpose of creation itself must be unified. It has to “string” all these desires as if on a shish-kebab. If this isn’t the case, then your work is not wholesome, and you are not wholesome in your desire. This will not do for we are given such diversity of desires in our world so we may pull them together and view them as one. Question: What does it mean to become a sage in Kabbalah? Answer: A “sage” is a person who has gained wisdom (Hochma). However, the Light of Hochma remains at absolute rest, and in order for us to obtain it, we have to possess the Light of Hassadim (Mercy), the “garments.” This means that a “sage” is honored not for his “wisdom,” but because he has made himself a garment from the Light of Hassadim, which “wisdom,” the Light of Hochma, was able to clothe in. We regard the Creator as the sage. A wise man is regarded as “Talmid Hacham,” “a disciple of the sage,” since he is learning how to obtain wisdom (Hochma) to let the Creator clothe in him. We honor Kabbalists for the anti-egoistic screens and faith they acquired, thanks to which the Creator’s wisdom had clothed in them. It isn’t the case that they simply got smarter naturally. Hence they are called the “disciples of the sage,” the Creator. Question: How do we explain to the public that the era of unbridled consumption is ending? Answer: A person doesn’t need explanations to feel hungry; however, when the crisis hits, only the government can provide them with food. Question: So we are building a state of common welfare, aren’t we? It is coming to an end anyway, and there is nothing we can do about it. The world is sinking into crisis, which is supposed to demonstrate to us that we cannot consume more than we need. You may not wish to accept it, but nature will force you to, like it or not. Besides, we can’t explain to the public what’s happening and tell them how they need to act, meaning how to build a new government, a new integral world, unless we send them to school. As we teach little children, so will we teach adults about the laws by which the world operates, the world that they now find themselves in. After all, if a person doesn’t comprehend the mechanisms of a fully integral world, he or she cannot survive in it. There isn’t a more effective and affordable solution to transform people than global education. Do you wish to keep getting what you need? Here you go, just don’t forget that you are supposed to come to the lesson. You want to riot? It won’t solve your problems. Recently, Amr Moussa, the Egyptian presidential candidate, has admitted that instead of a new beginning, the revolution has resulted in a deeper crisis which doesn’t seem to be ending. In his words were sincere pain; he did not expect this turn of events. It isn’t his or Mubarak’s fault: They simply didn’t see the process as a whole. People thought the new government would find the funds, but money alone is useless. Hence, there is no other way but to figure out how many tailors, farmers, and other workers we need in order to keep a small percent of the population in the necessary areas of production, while the rest of the people have to be sent to school. There is no alternative, this is the way it has to work. This is the only solution that will provide people with the basic necessities so they don’t riot and understand that there is no place to go: The is the new world and the integral system we live in. The truth is that we have stepped into a new territory rather than into a crisis; we must operate in the new format governed by different laws. And we have to pass through this bottleneck in order to reach perfection.